The Mailbag will pack & ship everything from letters to perishable foods and luggage to boat parts. Our location offer a full range of shipping including UPS, FedEx Express, DHL, USPS and other carriers. Shipping a musical instrument? Stereo equipment? a TV? 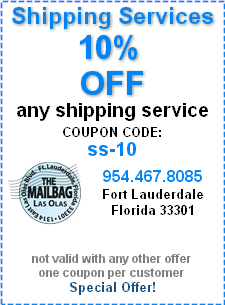 The Mailbag Store shipping services will fit your needs. Our store offers an exclusive shipping service, as well as packaging and crating, for oversized packages. Shipping an even bigger item? A grandfather clock? Shipping artwork? Do you or your business need to pack & ship something that's a little larger? A lot larger? We will ship by freight when necessary, this includes auto parts, furniture, and many other large items. Have you ever noticed the long lines at the post office around the holidays? You will rarely encounter a long line or wait with us. You may also be surprised to know that for packages over a few pounds, the post office is often the most expensive option. We will be happy to assist you with your holiday shipping and packaging service selections. Traveling this season? We can also ship your bags and luggage right to their destination!